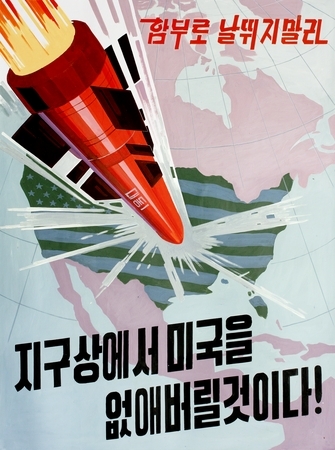 The text of this North Korean propaganda poster says, “We will blast the U.S. from the face of the earth!” Hand painted by Yang Byongsu, this reproduction of a printed poster is part of a collection at the University of California, San Diego. (CN) – European lawmakers on Thursday expanded economic and technological sanctions against North Korea, following a week of land and sea missile tests by the secretive regime. The Council of the European Union added new sectors to the sanctions list, which has been in place since 2006. Investments in the conventional-arms, metallurgy and metalworking and aerospace sectors are now prohibited by the EU. Additionally, lawmakers agreed to bar EU entities from offering computer services within North Korea and banned services linked to manufacturing in the chemical, mining and refining industry, given leader Kim Jong-un’s nuclear ambitions. Lawmakers also sanctioned four individuals over their support of North Korea’s weapons programs, bringing the total number of people subjected to asset freezes and travel restrictions to 41. Seven other entities have had their assets frozen.